The Orphan Fund was created to assist the families of the soldiers who sacrificed their lives to secure the independence of Nagorno-Karabakh. From 1988 to 1994, the Armenians of Nagorno-Karabakh fought a defensive war in order to defend their homes, families and their historic homeland from Azerbaijani aggression. In the process, over 10,000 Armenians, mostly men, either lost their lives or were disabled, and their families were left with virtually no means to survive. The Orphan Fund was created to assist the families of the soldiers who sacrificed their lives to secure the independence of Nagorno-Karabakh. 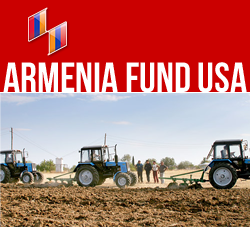 Armenia Fund USA is providing assistance to a total of 8,000 children. Each family receives a monthly payment of 2000 drams or approximately $5. While this is a small amount by Western standards, it helps provide for the basic needs such as clothing, food and school supplies. Armenia Fund has arranged for monthly payments to be distributed to the orphans through the Armenian Central Bank. The funds are sent to the local post offices where they are handed over to the surviving parent or legal guardian. The Orphan Fund has been providing much needed assistance to families in Nagorno-Karabakh since 1999. Funds are typically added to an investment bank, from which families are supported through interest. Large donations can be directly allocated to the orphans upon patron’s request. Thanks to generous contributions by Hirair and Anna Hovnanian, the Armenians of France, the late Ms. Ohanessian and the late Lillian Terchoonian Trust, over $875,000 has been raised towards a target goal of $1.5 million.